The Simplicity Hardwood Cremation Urn is made in the Pacific Northwest. 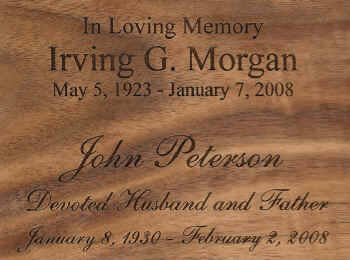 Designed from furniture grade hardwood plywood with 1/8 inch veneer, this affordable urn has the look of a solid wood urn. Available in Cherry, Oak, Walnut, or Cherry with a Rosewood stain. The Rosewood is a darker than the Cherry but still has a red tone. Loaded through bottom opening panel. It is important to keep the cremains in a sealed plastic bag inside the urn. This urn can hold standard plastic Temporary Cremation Containers (TCC) which are no bigger than 4 1/2" x 6 1/2" x 8.5" (LxDxH).